NEW CASTLE — The Wentworth Marina catch-and-release striped bass tournament will take place from 7 a.m. to 2 p.m. Sunday, June 28. Sponsored by Mercedes-Benz, the catch-and-release tournament, which includes a mackerel division, is the sole fundraising event for Little Harbour Charitable Foundation. The all-volunteer nonprofit is credited with disbursing more than $2 million to programs and projects that have made a discernible difference for children, youth and their families on the Seacoast. 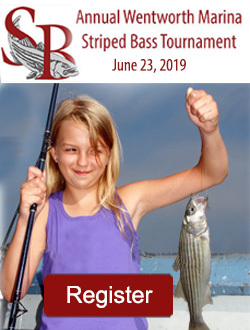 Limited to 100 anglers, ages 8-16, tournament fishing begins first thing June 28, followed by many activities on the marina docks, including: marine educational programs, entertainment, face-painting, lunch and the trophy awards ceremony for both striped bass and mackerel. Anglers compete for six prize trophies in three age group categories. A tournament vessel is also available for mackerel fishing for the first 35 sign-ups. ■ Blue Ocean Society: Delivering hands-on marine educational programs within schools to foster an appreciation of local marine life, and developing stewards for a healthy marine environment. ■ Northeast Passage: Providing a new therapeutic recreation services program within school systems to facilitate the inclusion of students into the school curriculum, through the use of adaptive equipment with a focus on social awareness. ■ Zebra Crossing: Funding will be expanding services offered to support children with chronic health problems through engaging enrichment programs. ■ Cross Roads House: Initiating a program providing the needed tools and guidance to overcome the major barriers to securing permanent housing. ■ Coast Conservation Association: Grant funds will provide a day of supervised fishing to 60 Big Brother, Big Sister kids and their mentors. In April, LHCF also responded to the immediate needs of 2014 beneficiary, End 68 Hours of Hunger, providing a donation ensuring no children served by the program would be without food, following a fire in the First United Methodist Church in Portsmouth. Additional information on all 2015 beneficiary organizations, as well as all other previous LHCF recipients, can be found on the website. For registration details, to donate to LHCF or to become a sponsor, visit www.stripertournamentforkids.com or www.lhcfonline.com or call Wentworth Marina at 603-433-5050.